Do you feel a slight draft coming from your window, yet the window is closed? Not only is that your air conditioning seeping outside, but that’s also your hard-earned money escaping your home. 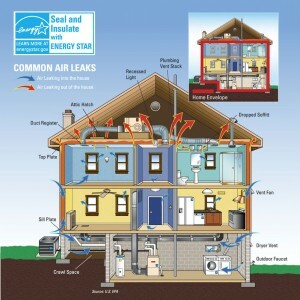 If you’re looking for ways to save energy and save money, one of the most cost-effective things you can do for your home is to check for any air leaks and sealing them. After all, you don’t want to pay to air condition the neighborhood this summer, do you? It can also affect your indoor air quality, increase the incidence of mold and rot and increase your energy bill. Start by walking around the outside of your home. 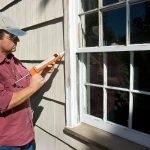 Inspect around windows and doors—are the frames still solid? Are there any cracks where you might feel cooler air coming through? While also checking the exterior, inspect areas where pipes, vents, air intakes or exhausts come through. The perimeter of these wall penetrations need to be sealed to stay tight. On the inside of your home, again check windows and doors at their frames and weather stripping. For your drywall and basement, the foundation walls and rim joist intersections might have some cracks or joints that need sealed. Pipes and ductwork go through walls, which can present some open areas for air leaks. Outlets, switches and lights should be sealed for safety and efficiency. Tubs and showers need to be sealed to prevent any water damage. And, finally, fireplaces are big offenders for air leaking—make sure the damper is closed when the fireplace isn’t being used. And while you might like having an open fireplace, consider installing glass gasket doors to the opening to help eliminate air leaking from the fireplace. So now that you’ve identified where your home is leaking air, it’s time to seal those areas, which is something you can easily do yourself over the weekend. Most leaks can be sealed with caulk—cracks smaller than ¼-inch can be sealed with caulk. For larger cracks and gaps, you will want to use foam. Windows Frames should be insulated with foam, but use caulk at the frame and drywall intersection. If you have a single pane window, consider adding storm windows to help insulate. Check the weather stripping and consider installing new weather stripping if it’s start to appear cracked. Doors Treat doors just as you would windows—caulk at the frame and drywall intersection and check the weather stripping. Trim, Lights, Outlets/Switches Using caulk around the trim of these smaller areas is pretty simple. For electrical boxes, use foam and install gaskets behind electrical plates. Pipes and Ductwork Wall penetrations for pipes should be sealed with caulk, while duct joints and seams can be covered with tape to prevent leaks.